The healthcare system operating in Hungary today is a hybrid process that comprises components from each of the 19th, 20th and 21st Centuries. The model of financing healthcare from an insurance fund based on a common risk pool, similar to a major element of the Bismarckian system that developed in Germany in the second half of the 1800s, prevails in Hungary's modern system. Following the wave of nationalisation in the second half of the 1900s, the single public health insurance scheme remained in place and so, as the heritage of a system from a former Communist country, public healthcare in Hungary carries with it low efficiency, injustice, and residual funding. However, there is also undoubtedly a progressive element in the system, in the form of performance-based funding - a component that is present in several well-functioning, 21st Century schemes around the world. Hungary's pharma industry has played a key role in generating the country's gross domestic product (GDP) and it was also one of the most important industrial branches even in the system of centrally planned economy. In COMECON, the organisation for international co-operation among Communist countries, Hungary was represented largely by its pharmaceutical industry. Prior to 1990, Hungary's pharma industry performed a `supply' role in the domestic and Eastern European markets; it did not function in a competitive environment, but rather achieved mandatory target figures. At this time, practically only domestic pharmaceutical companies were present on the Hungarian market. Importation of drugs was severely restricted and even low scale imports were stringently regulated. Prices and charges to be paid by patients were determined by central regulations and were set very low. As a result, the choice and sales volume of drugs on the market were also low. During this period, approximately one third of the products was exported to Western European markets and the US. However, the presence of Hungarian pharmaceuticals in these markets enabled the industry to familiarise itself with a competitive market environment and, as a result, it learnt how to comply with the market requirements and so was able to adapt more easily than other industries to the new market conditions in the period following significant change in the political regime. Health funding has survived the system of planned economy without major changes. Indeed, while the health funding system has survived the period of state socialism, consequently it is not structured to support a competitive environment; yet looking at Hungary today, it is clear that competition exists - for funds. As a result of a considerable lack of funds, professional organisations, health institutions, service units, and individuals are all competing in unclear conditions in an attempt to pursue their ambitions for suitable working conditions - whether it is the availability of instruments, tools or extra income to supplement low salaries. This usually involves self-exploitation, which reduces personal and institutional effectiveness. Fundamentally, this type of competition is not beneficial at a societal level; however in the present situation this is what ensures that the healthcare system in Hungary is able to function at a high level. Legislation today adapts to an economic system in which the expectation of free and full healthcare is regarded as a civic right. This presumes a system of full employment, a scenario in which the distinction between a civic right and an insuree's right is insignificant - and so there is no need to determine whether patients are entitled to certain health services as citizens or as insurees. 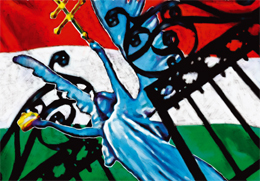 Therefore, competition in Hungary is generated between various institutions, but in circumstances where there is really no suitable environment for competition. Analysing the healthcare system in the US, Michael Porter writes about a single-payer healthcare system - that any healthcare system that functions in a competitive environment is better than a single payer , or state-controlled, system. In 1998, 7.3 per cent of the GDP was appropriated for the healthcare system, while in 2002 it was 7.8 per cent. During this time, almost 30 per cent of the total health expenditure went on medicines, amounting to 2.1 per cent of the GDP. Statistics from the Organisation of Economic Co-operation and Development (OECD) reveal a clear trend that the countries in which the GDP is lower appropriate a higher proportion of health expenditure for their pharmaceuticals. It is not surprising then that following the political and economic changes in 1990, when the market restrictions were also lifted, the number and composition of pharmaceutical companies changed and the choice and volume of medicines in Hungary grew significantly. Indeed, the turnover of drug products grew nearly tenfold between 1990 and 2000, and the range of medicines grew more than threefold. Both trends have continued ever since; the volume of turnover for pharmaceuticals grew approximately twentyfold between 1990 and 2004, and reached a value of HuF483bn ($2.4bn, Ä1.96bn); which was a growth rate of 7 per cent compared to the previous year, and this growth in value subsequently increased prices. Sales of prescription brands played the most significant part in the increased turnover of drugs - they amounted to 78 per cent of the total market in 2003, while the sales of over-the-counter (OTC) drugs represented 22 per cent. In fact, choice and availability of OTC drugs are keeping step with world market trends. The reason for this is partly the increased number of products in distribution, and the pressure exerted on controlling expenditure on health and pharmaceutical products. Yet, funding schemes have difficulties and are barely capable of coping with the general trend concerning the growth of health expenditure. Therefore, national governments are trying to impose various restrictions in this area. In Hungary, the Health Insurance Fund covers 60 per cent of drug costs, while 40 per cent is covered by consumers (though the ratio covered by consumers is growing year on year). The price level of medicines is lower than average prices in OECD countries, though Hungary's average price is rising slightly each year. However, these price increases do not have significant influence on the structure of medicine consumption - the fact that the prices of original brands increase at a higher rate does not change the ratio of usage between original and generic brands. Although the rate of substitution by less expensive brands is growing, this is to a large extent counter-balanced by the fact that physicians prefer original brands, and also that patients insist on proven brands they have taken for a period of time. The substitution of original with less expensive generic brands is desired by the public healthcare system and is also present in the regulations. While some patients insist on using proven brands, low purchasing power is a strong contributing factor in generating demand for inexpensive brands, and - as a heritage from past times - people in Hungary expect to have access to cheap medicines. Patient behaviour has been shaped by circumstances provided by the public healthcare system for more than 40 years. Patients are adapting to the new circumstances, however this adaptation has been slower than the transformation process, and it has also been different in various segments. The healthcare system has not been transformed to a great extent, but patients have adapted to the changes in the pharmaceutical market. On one hand, they have had to become accustomed to the greater choice of pharmaceuticals; however it has been the new increased price levels that have caused problems. Patient adaptation to the increased prices has been very difficult and slow, and it is in this area that large groups of people are really sensitive to the slackening of government subsidies; they can hardly, if at all, afford to buy their medicines from their own resources. Some groups, such as elderly people - many of whom are single - have found the cost hikes to be a significant problem, considering their low purchasing power. In some cases, this is simply due to the fact that they are not accustomed to a situation where pharmaceuticals are not sold at symbolic prices any more; healthcare expenditure now represents a significant amount of their family budget. Therefore, people's attitudes towards pharmaceuticals and drug prices must change so that the mind-set of patients and physicians cannot hinder the distribution of medicines and the introduction of new brands to be sold at higher prices. When international drug companies came to Hungary, they brought new marketing and sales methods that were unfamiliar. In fact, it is medical communication and promotion that has undergone the most fundamental change. One example is the introduction of medical representatives which formerly did not participate in the sale of pharmaceuticals. This has been a significant change to accept though communication regarding medicines is still strictly regulated by relevant laws. Promotion and advertisement is limited and prescription medicines may only be advertised for physicians in professional journals and magazines. The law on advertising does not contain specific provisions regarding the content and form of professional advertisements; however pharmaceutical companies have created the Ethical Communication Committee, a self-regulatory body that stipulates the limitations on the scope, conciseness and format of brand information, as well as the mode of the information transfer and the justification of the authenticity of information concerning medicines. The Ethical Communication Committee has compiled an 'Ethical Code', which sets out the rules governing the advertising of pharmaceuticals and the communication vehicles that may be used; it also contains the rules regarding the description of medicines, as well as general requirements concerning the communication of medical and pharmaceutical information. Responsibility for the regulation and enforcement of the Code lies with an Ethical Committee formed jointly by the Association of Innovative Pharmaceutical Manufacturers (AIPM) and the members of the Association of Pharmaceutical Manufacturers in Hungary. In any cases of non-compliance, the Committee can issue statements of condemnation that are announced among the members of the body. Although such announcements have a negative effect on reputation, this is not as serious as in Western European countries. However, non-compliant players are subject to increased scrutiny. OTC brands may be promoted and advertised for consumers in both the printed and electronic media. Such advertisements must contain the name of the medical product and the relevant instructions for use, as well as a notice advising consumers to read the information on possible side effects, and to consult their physicians or chemists. With regard to television adverts, the regulations dictate that text must not be read at high speed; a minimum of seven seconds must be allocated for consumers to read text on the screen. With printed advertisements, the text must cover at least 10 per cent of the total surface. The system of medical representatives has become Hungary's most important and efficient tool for communicating pharmaceutical information. This marketing tool was introduced in Hungary only in the 1990s, since this type of communication vehicle was simply not needed in the business environment that prevailed earlier. When multinational distributors first tried to introduce their 'normal' marketing activities, including sales reps, into the country, domestic manufacturers and physicians targeted by representatives viewed the practice with suspicion. Physicians regarded their activity simply as advertising, rather than as a valuable information transfer, or as a useful tool for the description of medicines. Therefore, they accepted the activities of medical representatives quite reluctantly. However, over time it became clear to these doctors that most drug distributors operating in Hungary were employing sales representatives who could describe a number of different medicines to them, and eventually they became much more accustomed to the practice. Today, medical reps regard description and information transfer to physicians as their top priority and domestic firms have taken over this practice both in Hungary and in neighbouring markets, where they were present earlier but only in a drug distribution capacity. Several studies support the fact that the average acceptance by physicians of the practice of medical representatives has grown, and the activities of medical reps are regarded more positively - although this may differ between various groups of physicians, and also according to the location of the activities of physicians. Hungary's clinical practitioners acquire information more frequently from foreign professional literature and from congress experiences; therefore, the activities of medical representatives are not the primary source of information for this group. However, the detailing by medical representatives is the most important source of information for the general practitioners; although many of them read professional journals, they acquire their primary information about specific medicines from the detailing of medical representatives. The recent introduction of this detailing has also had a significant effect on the distribution of medicines. Due in part to the novelty of this type of communication and also the lower degree of saturation of the target group, there have been considerable improvements in the uptake and distribution of medicines, which can be attributed to this tool. This is proven by several examples of drugs that were at one time distributed in Hungary as imported brands. When the manufacturers of such brands appeared on the Hungarian market and started to detail these pharmaceuticals, the formerly very low turnover of these brands grew significantly. Every major manufacturer and distributor now employs medical representatives, and one consequence of this is that there seems to be a significant shift in the turnover of both original and generic brands (see below). Companies with the highest volume of marketing activities, where the major activity is product detailing, promote not only original, but also branded and various generic products (see below). This type of promotion activity satisfies the expectation of the government, in that inexpensive generic products should substitute for expensive generic brands, and it also meets the expectation of patients, in that they should be provided with access to, and the option of, less expensive pharmaceuticals. It is not surprising, therefore, that the proportion of generic brands is growing. Patients, of course, do not only want inexpensive pharmaceuticals but also wish to acquire the newest, most effective brands; they often insist on taking only 'proven' pharmaceuticals. However, these expectations are often contradictory. The types of diseases, the disposition of physicians towards certain avenues, and patients' willingness to accept prices all compete to determine the dominant expectation; which then ultimately determines the choice of drug. Several studies prove that physicians regard the willingness of patients to accept prices as a great obstacle, and that doctors may not inform patients about the properties of certain brands (including the extra benefits they might have) that have higher prices; instead, they expect that patients will only accept lower prices (even if it is not always the case). According to empirical research, the doctors make the decision about the prescription drugs and the pharmacists suggest the cheaper generic drug only in a few cases. This can be explained by the pharmacists' general unwillingness to take the responsibility for substituting a medicine, especially based on their experience that patients want to have the drug prescribed by the doctor, or to stick to the 'proven', branded medicine. Recent research has highlighted another key issue: the application of medical representatives is vital, but long-term success requires more than merely an increase in their numbers. It is necessary to combine the activity of medical reps with intensive brand building and support, for both original and generic products.